One of the activities I signed on for this year as part of the PTA was to provide a baked good on Valentine’s Day for a teacher at my daughter’s elementary school. Sweets for the Sweet is our school’s way of thanking the teachers for all their hard work. So, in order to provide a tasty baked good for one lucky teacher I started doing some surfing to find a good recipe. I discovered Dessert First Girl and her Apricot Crumb Coffee Cake. Dessert First Girl is very impressive….she is actually trained in all things pastry, is a food writer, and has written cookbooks! I am in serious awe. I decided to attempt her coffee cake recipe, although I made a couple of small changes based on the fact that I am lazy and was missing an ingredient or two. So, I encourage you to head over to Dessert First Girl and see her version of this recipe but below is what I made tonight. This coffee cake is not overly sweet, which I prefer. The recipe is fairly easy to make, too, although all three steps required my Kitchenaid mixer which meant washing it several times but the final product was well worth the extra work. For the cake: In a small bowl, combine the flour, baking powder, cinnamon, nutmeg and salt. In a mixing bowl, cream the butter and sugar until smooth (about 3 minutes). Add the egg,mixing until smooth. To the mixer with the butter and sugar, add the four mixture alternating with milk/vanilla. Stir only until combined. Spread the batter in a 9 inch spring form pan that has been sprayed with non stick spray and dusted with flour. For the Cream Cheese layer: In a mixing bowl, beat the cream cheese, sugar and egg until smooth. Stir in the dried apricots and spread over the batter in the spring form pan. For the Streusal Crumb Topping: Combine the flour, sugar, cinnamon, baking powder and salt in a bowl. Mix in the cold butter until crumbly and mixture holds together if pressed gently between fingers. Sprinkle the streusal topping on top of the cream cheese layer. Bake in a 350 degree oven for 35 to 40 minutes or until a knife inserted into the middle comes out clean. Need more Apricot Recipes? Check out the linky! That sounds amazing! I love a delicious breakfast you can fix the night before and enjoy the next morning! 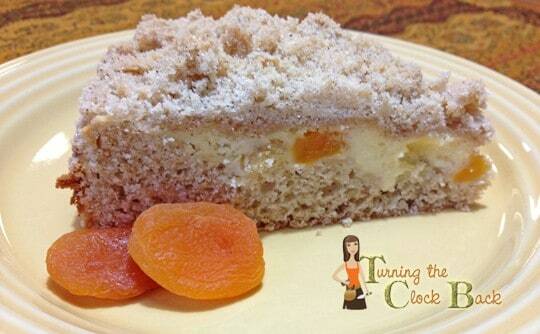 Apricots and cream- great combo! I have never had too many things with apricot but this looks delicious. Oh my! That looks so good. You share the best recipes. I also love a cake that isn't too sweet, plus I love apricots. I will have to steal this one. Just hit print! You are welcome to it! Mmmm I love the combination of apricot and cream cheese! I really love the way this looks! My husband is a major coffee cake fan and this is different than any other I have made, so I'm definitely gonna hold on to it. Thank you for linking up at the Weekend Kitchen Link Party last week -- be sure to link up this weekend too (ends Monday at midnight).